Give yourself an energy boost that’ll last until lunch. Whether you’re a full-blown vegan or testing out the dietary preference with a vegan breakfast, lunch, or dinner, research shows there is a myriad of benefits to following an all-vegan diet. Seriously, cutting out all animal products and byproducts such as meat, eggs, dairy, and honey, from your diet can lower your risk for chronic illness and some life-threatening diseases. These include obesity, diabetes, hypertension, heart disease, and certain cancers. “A plant-based diet provides vitamins, minerals, fiber, antioxidants, and phytochemicals that are important to all of our body processes,” says Lauren Pincus, M.S., R.D.N., author of The Protein-Packed Breakfast Club. However, some nutrients are harder to consume with a plant-based diet—one of those being protein. “It’s definitely challenging to ensure adequate protein intake in a vegan diet, and it takes a little planning to get it right, especially at breakfast,” Pincus says. Here, dietitians share the high-protein vegan breakfast recipes they rely on to give them a lasting energy boost until lunch. Add all ingredients except garnishes to a Mason jar or container with a lid, and mix very well. When ready to serve, stir the pudding and top with banana slices, peanut butter drizzle, and chopped peanuts. Combine all ingredients in a blender, and blend away! Overnight oats are so in right now—and for good reason. They’re easy to prep and incredibly nutritious, packed with tons of protein and little sugar. Following right along with the trend, Sharon Palmer, R.D., of The Plant-Powered Dietitian, developed a carrot cake oats recipe, which has become a hit with her followers. “It’s super-easy!” she says. Select a container for your overnight oats, such as a Mason jar or glass storage container with a tight-fitting lid. Layer as follows: oats, cinnamon, allspice, flaxseed, coconut, walnuts, and carrots. Pour over vanilla, maple syrup, and plant-based milk. The next day, stir together with a spoon, and enjoy cold or warm. “This vegan wild blueberry peanutty protein smoothie is a nutrition powerhouse. It’s packed with 24 grams of protein thanks to some tofu and powdered peanut butter,” Pincus says. “The fiber clocks in at 13 grams, which is more than 50 percent of the daily recommended intake for women.” With 50 percent of your recommended daily vitamin A, 60 percent of calcium, and 25 percent of iron, how could you go wrong? Garnish with extra powdered peanut butter. Add these high-protein vegan breakfasts to your weekly meal planning for a blast of filling energy that will last until lunch. Listen to your body to see if you show any signs that you’re experiencing dehydration. 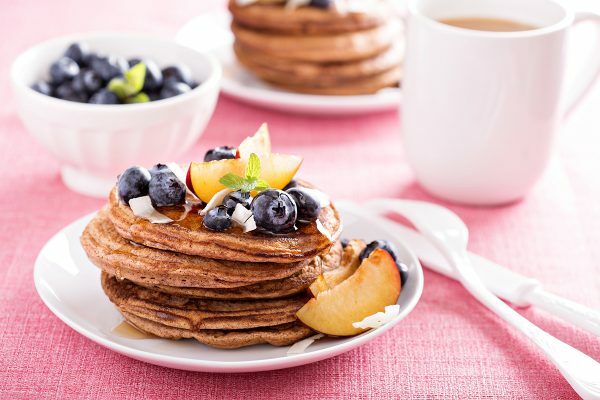 Savor a stack of flapjacks sans gluten anytime the craving strikes.